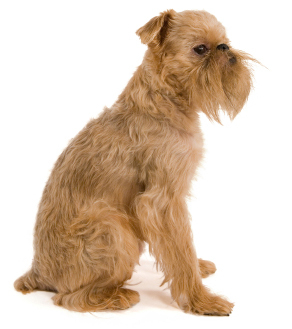 Learn about the temperament and personality of the Brussels Griffon. Discover what he's like to live with, his traits and characteristics and how he generally behaves. And look at lots of Brussels Griffon photos. Brussels Griffons are happy little "Velcro" lapdogs. They usually attach themselves to one or two people in the household and will want to be with that person 24-7. He will want to sleep with you, go to the bathroom with you, and sit on your feet while you do the dishes. You will never be alone again. The Brussels Griffon does not do well if he does not get lots of companionship -- he will become sullen and withdrawn. A well-cared for Brussels Griffon is a cheerful, charming, curious companion dog. They are intelligent and sensitive and do well with obedience training. They can be taught to perform a variety of tricks. And if you laugh at them, you will only encourage them, as they love to act like the home's court jester. They are very eager to please you. Making you happy makes them happy! They are good at obedience trials, agility competitions, conformation, and tracking trials. However, they can be difficult to housetrain and are sometimes stubborn about walking on a lead. They make good watchdogs and will bark when someone comes to the door, but they are often shy with strangers and new situations. They like to be active. (They are especially energetic the first couple years of life.) They will want to take daily walks, and they love to romp and play, running circles around your house just for the fun of it. They do best with a fenced-in yard so they have room to run around. They get along well with other pets, but they don't know they are small, so they might try to dominate larger dogs and get hurt. They are so small that most breeders will not let them go to homes with very young children, who might unwittingly injure the dog. If you are looking for an affectionate, somewhat self-important, toy dog who will need to be an integral part of your family, a dog with almost human expressions, the Brussels Griffon might be for you! The Brussels Griffon is harder to train than most other dog breeds. He learns new commands more slowly than the majority of other breeds. You will need to be extra patient when Training him. The Brussels Griffon sheds practically no hair at all. You'll virtually never find a hair in your home! Show coat (more work): Strip his coat every six months and brush it daily.